No visit to Kauai, Hawaii's Garden Isle is truly complete unless you take the time to visit one of the island's beautiful botanical gardens. Botanical gardens offer a refuge for plant life, and for the ecotourist there is no better way to learn about imperiled local plant species than in the very spots where they’ve found safe haven. These gardens have a special place on the Garden Isle. Kauai is home to three of the five gardens that comprise the National Tropical Botanical Garden (NTBG): Allerton Garden, McBryde Garden, and Limahuli Garden and Preserve. The other two gardens are Kahanu Garden located near Hana on the island of Maui and The Kampong located on Biscayne Bay in Coconut Grove, Florida. The National Tropical Botanical Garden is a not-for-profit institution, dedicated to discovering, saving, and studying the world's tropical plants and to sharing what is learned. Today the NTBG has grown to encompass nearly 2,000 acres of gardens and preserves. Let's take a look at the three National Tropical Botanical Gardens located on Kauai, as well as two other gardens found on the island. Limahuli Garden is located on the north shore of Kauai right before the road ends at Ke'e Beach, in Ha'ena. This beautiful tropical garden is back-dropped by the majestic Mount Makana, more popularly known as Bali Hai for its role in the 1958 film South Pacific. Limahuli Garden is a 17-acre terraced garden that is part of the 985-acre Limahuli Preserve. I recommend that you pick up a copy of the garden guide at the visitor center and then proceed to follow the 3/4 mile Limahuli Garden Loop Trail which takes you past examples of the numerous plants used by the original Hawaiian settlers from Polynesia for art, clothing, shelter, tools and food. Limahuli Garden is open Tuesdays through Saturdays. Self-guided tours are available from 9:30 a.m. to 4:00 p.m. and cost $20 for adults (18 years and above). Children 18 years and younger are admitted free. A guided tour is offered at 10:00 a.m. and costs $40 for adults, $20 for children 10-17 years of age. No children under 10 are allowed on the guided tour. Reservations for the guided tours are required in advance. Allerton Garden is a masterpiece of garden art, transformed by the hands of Hawaii's Queen Emma, a sugar plantation magnate, and most recently an artist and an architect. The result is breathtaking featuring deep-purple bougainvillea, giant Moreton Bay fig trees that were featured in Jurassic Park, numerous water features and sculpture, the lovely Lawa'i Stream and so much more. Allerton Garden is located in the secluded Lawa'i Valley. Tour check-in is at the Southshore Visitors Center, a short distance from the Valley rim. Allerton Garden is open daily. The Garden is accessible only by 2-1/2 hour guided tours. Tours depart on the hour from 9:00 a.m. to 3:00 p.m. During some periods of the year, the 9:00 a.m. tour is not offered. The cost of the tour is $50 for adults (13 years and above) and $25 for children 6-12 years of age. Childrend 5 and under are admitted free. Reservations are required in advance. All tours include Garden transportation into and out of the valley. An Allerton Garden at Sunset tour has been added which included admission to the home where the Allerton family lived and in which they greeted numerous world figures such as Jacqueline Kennedy. The tour also includes a beverage and dinner provided by Living Foods Gourmet Market and Cafe on the stunning lanai as the sun sets into the Pacific. Ticket prices $95 for adults, $45 for children (6-12). Children under 5 are admitted free of charge. McBryde Garden in Lawa'i Valley is home to the largest ex-situ ("off site") collection of native Hawaiian flora and exotic plants in existence, including extensive plantings of palms, flowering trees, heliconias, orchids, and countless other plant types from the Pacific Islands, South America, Africa and Indo-Malaysia. Visitors have the opportunity to see many rare, endangered Hawaiian plants and learn about the efforts being made to save them in a living laboratory where scientists continue to learn new things about these plants and their uses. A visit to the garden requires a one-mile walk over mostly unpaved or grass paths with some uneven terrain and some paved or rock stairs. McBryde Garden is open daily. The Garden is accessible only by a 15-minute tram ride from the Southshore Visitors Center. Trams depart on the half-hour mark at 9:30 a.m to 2:30 p.m. In summer an additional 3:30 p.m. tram is added. Visitors board a return tram on the hour of their choice with the last tram departing the garden at 4:00 p.m. (5:00 p.m. in summer). Visitors should allow 1-1/2 hours within the garden. Cost of the self-guided tour of the Garden is $30 for adults (13 years and above), $15 for children 6-12 years of age. Children 5 and under are admitted free. Reservations should be made in advance. 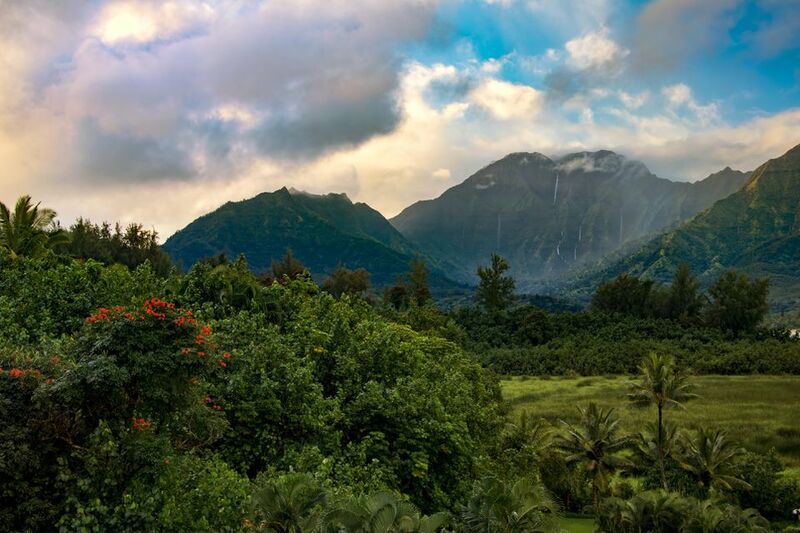 Na 'Aina Kai Botanical Garden is located on Kauai's north shore near the town of Kilauea. Originally begun as a landscape project by Joyce and Ed Doty in 1982, the Garden has grown to over 240 acres including 12 acres of diverse gardens which feature one of the largest collections of bronze sculpture in the United States. Since 1999 the Garden has operated as a not-for-profit foundation and open to the public for tours and private events. The property also includes the Doty's former home, orchards and a 110-acre hardwood plantation which helps ensure the sustainability of the garden for future generations. The Na 'Aina Kai Orchid House Visitor Center and Gift Shop is open each Monday from 8 a.m. until 2 p.m.; Tuesday, Wednesday and Thursday 8 a.m. until 5 p.m.; and Fridays 8 a.m. until 1 p.m. Na 'Aina Kai is closed to the public on weekends and holidays. Na 'Aina Kai offers only guided tours of their gardens. All tours are conducted by an expert docent and are suitable for those over 13 years of age. The Garden offers a wide variety of tours by foot or by tram ranging in length from 1-1/2 to 5 hours and ranging from $35-$85 depending on the type of tour and tour length. One of the most visited areas of Kauai is located within Wailua Marina State Park on Kauai's eastern side or Coconut Coast. On the shore of the Wailua River, you'll find Smith's Tropical Paradise which includes the popular Smith Family Garden Luau, the Fern Grotto Wailua River Cruise, Smith's Weddings In Paradise, and the Smith's Tropical Paradise botanical and cultural garden. This 30-acre garden includes over a mile of pathways featuring over 20 types of fruit trees, a bamboo forest, the popular Flower Wheel and Flowering Tropicals area and a Japanese-themed garden. The garden is a popular spot for an afternoon picnic, wedding or their evening luau. The garden is open daily from 8:30 a.m. to 4:00 p.m. The entry price is just $6 for adults, and $3 for children ages 3-12.